Many great literary works make some reference to water. Rivers run through stories and generally represent the movement of life. The constant movement. Change. 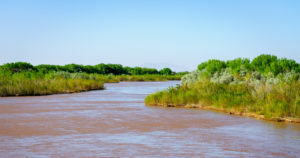 After crossing the Rio Grande hundreds of times in my car, over the bridge, I was shocked to go down the banks one day and see how rapidly it is actually moving. From even a short distance above, it appears to be totally stagnant. It is anything but. It is, like all rivers, charging hastily forward, downward, to its home in the ocean. Greek philosopher, Heraclitus, said “No man steps in the same river twice.” (I would say “person” of course.) And it’s true. But what does it really mean? That the river is always moving? That life goes on? That you don’t get a second chance to correct a mistake? Or to relive a happy time? If you try, it won’t be the same. Something will be different. Everything will be different. Try it more times – different again. Different every time. Read a book again. See a movie a second time. It’s no use; you can’t recapture what you had before. You can’t go home again. Thomas Wolfe said that and used those words as the title of a novel. I would say it means the same thing. Home, whatever that is, is gone, when you leave it, except in your memory. Return to your old elementary school. You will be shocked at how it seems to have shrunk in size. The river just keeps on flowing and we flow with it. Or fight it if we’re fool enough to try. Also attributed to Heraclitus: the only constant in life is change. (He clearly gave this subject a lot of thought.) A silly joke; a play on words? Hardly. No, it’s the truth. I know some people who cannot, will not, change. They wear their hair and their makeup the same way they did 40 years ago. They think they look the same. But they don’t. The hair might look the same, but the face under it, like Dorian Gray’s picture in the attic, is changing. Best to change with it. Accept this as a fact of life. Or fight it if you’re fool enough to try. But heaven help you. None of this is bad news, I think. It’s o.k. You’ll live, at least for a while. We’ll all live. Let it go. Let it be. Just roll with the river. I bought Marie Kondo’s tidying up book a couple of years ago and started folding t-shirts, socks and underwear according to her guidance. But a week later, I stopped. In the meantime, she has made it big on TV, and my drawers are a mess. Socks gone wild! As I recall, Marie wants us to spend time with our stuff, folding and tucking, and thanking them for performing well. It has been quite a few years since my underwear was involved in anything involving performance excellence, unless you count bladder control. She also encourages us to get rid of stuff that doesn’t spark joy. Honestly, none of my stuff sparks joy. It’s just stuff – stuff I either need or want, and it resides in my home. I’m careful about not having too much stuff, and I regularly toss or donate, but if I purged on the basis of joy, I’d have a mostly empty house. But here’s the rub – I do have obsessive-compulsive tendencies, and it wouldn’t be all that hard to push me off the ledge into the dark abyss of tidydom. Under my careful tutelage, records, CDs and spices are all in alphabetical order. I take my vitamins and meds in alphabetical order. A for aspirin, C for CoQ10, D for vitamin D, F for fish oil, L for Lisinopril and M for multivitamin. Dale keeps asking what the W is for. There is no W. It’s M, and he knows it. There are days he does not spark joy, but I don’t make him leave, do I? And yes, it’s Dale, who sort of keeps me within the boundaries of normal. He is the moral opposite of Marie. Dale doesn’t believe in the magic of tidying up. I wouldn’t call him a slob or hoarder. That’s a bit harsh. Let’s just say he’s differently organized. Mess-tolerant. Stuff-friendly. But because we are married, and people who stay married have learned to compromise, I’ve lowered the bar and somewhat willingly sink toward his standards of cleanliness and order. It’s just too hard to fight about it. Dale makes an effort to meet me in the middle. The house is never as tidy as I would like it, but it’s not the frat house of his dreams, either. So, I don’t know. Is Marie married or living with someone? That can’t be easy. In our 40-year marriage, we’ve found it is sometimes hard to find joy in each other, let alone each other’s stuff. We’ve reached a détente of sorts. It’s like whatever, do what you want, keep what you want. Let’s just love each other until this party is over. Have you heard the one about the 100-year life? It’s not a joke. It’s a thing. It used to be a marvel when people lived to be 100. My own mother lived until she was 106. With advances in health care and technology, lots and lots of baby boomers are going to live to 100 and beyond. Many businesses have been betting that there’s a way to cash in on all the baby boomers headed for retirement. They could sell more hearing aids, anti-wrinkle cream, incontinence products, cosmetic surgery, walk-in bathtubs, etc. To be sure, there is a so-called longevity economy and it is turning into a huge emerging market. But one of the surefire bets was that boomers would want to move into senior-housing facilities that would cater to boomers, especially as they might require more care. Hasn’t worked out that way however. There’s a surplus of senior housing and boomers are passing for now. We’re staying put because we’re staying fit and value our independence. The latest demographic trend indicates that seniors are not moving to senior housing until they reach 82 years old. The oldest boomers will not turn 80 until the year 2026. Whoops. Occupancy rates for assisted living facilities are at their lowest level since they started tracking this stat in 2006. The glut may also be attributed to an over estimation of how many seniors can pay anywhere from $3,000 to $8,000 per month. At those prices, it’s no surprise that seniors over age 90 are trying to stay in their own homes and live independently for as long as they can. Today’s 75-year-olds have the health profile of 65-year-olds. Fifty per cent of people ages 85 or older say they are healthy enough to work. And work is what they do. Have you noticed that it’s no longer unusual to see much older workers on the job? Fast food servers, hotel clerks, maintenance persons, teachers. Gray haired workers are showing up across the occupational spectrum and we hardly notice the difference. 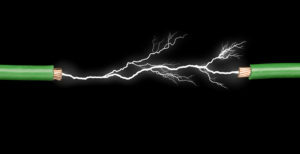 So there you have it…an entire generation is morphing into an Energizer bunny that keeps going and going and going. Let us walk and confer together, my son, for I am eager to learn your impressions of the new school. There is much to tell, Father. Beginning students at Semicircle are not permitted to speak aloud for the first three years. We are instructed to listen carefully but forbidden to make written notes. The Teacher insists that we internalize the lessons rather than routinely memorize content. The advanced students are able discuss the lessons with Pythagoras, is that not the case? It is so, but for now we are silenced. What manner of instruction has transpired? There are many things and sundry. Today we observed the initiates as they explored relationships between the lengths of sides in a right triangle. I am but a tiller of the soil, my son. Please elaborate. A thousand pardons, Father. I have been cautioned that on occasion my excitement with discovery exceeds my reasoning and proper manners. If I may continue, these corners of your fields are formed in a manner that The Teacher classifies as ‘right’ angles, each measuring 90 degrees. A right triangle contains one of these right angles. The longest side of a right triangle is called ‘hypotenuse’ and is always opposite the right angle. The area of a square constructed on that side of the triangle will be equal to the sum of areas constructed on squares of the other two sides. Yes, I understand that geometry is at the foundation of ownership. It is required that we respect boundaries and the adjacent property of a neighbors’ field. All our lessons at Semicircle include reference to the extended application of concepts. 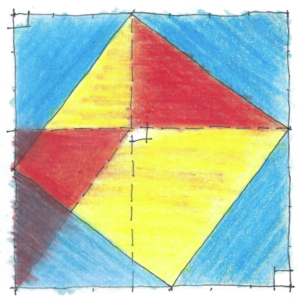 To verify his teaching The Teacher drew a diagram that placed four congruent right triangles defining with their right angles four corners of a large square. I can replicate it here in the sand. I can see that the remaining area is a smaller square whose sides are delineated by the length of the hypotenuse. Exactly, but when I draw a second diagram thus, with the same four triangles grouped in pairs that define two intersecting rectangles, the remaining area is, by contrast, two smaller squares. It follows that the sum of their areas is the same as the area of the remaining single square in the first diagram. Have I demonstrated that to you, Father? The hour is late, Alex. Tomorrow we will speak more of these things. Harpeth Rivers is a writer, musician and happy homeowner still living and working in New Mexico. His latest book, Proof, an illustrated fable, is available at Amazon. It was Monday. I parked my car and was walking toward the entrance to a thrift shop, where I planned to search for cheap things I might turn into art or something like it. Items were displayed on the porch. I got excited, and with my eyes on the prize, I tripped on a parking lot car stopper and went face down. People were nice. Stuff flew out of my purse, and someone gathered it up. Someone else brought me a chair. A woman with a young child had a wad of tissues for my bleeding chin. I felt OK, but I sat there keeping pressure on the chin. I asked someone for a mirror, and when I saw the gash, I immediately knew I’d need medical treatment. I drove to a walk-in clinic near my house. I did not know there’s a difference between a walk-in clinic and an urgent care clinic. The physician’s assistant at the walk-in clinic took a quick look and said I needed to go to urgent care. I used Google Maps to find an urgent care clinic down the street. Oh, and Dale had let his phone die, as he often does, so there was no way to reach him and let him know I’d be late. I finally texted a neighbor and asked her to let Dale know where his wife was. By this time, I started bleeding again. I thought that might bump me up in line, but it did not. A woman with five children offered to let me go in front of her, and I said, seriously, you must be the kindest person ever, but I’ll just wait my turn and mop up the blood as best I can. The gash only needed two stitches. It didn’t hurt much at all, and I thought I was golden. Until the next day, I woke up with bruises all over and sore ribs. The ribs actually got worse the next day, but they are getting better. Still, I’m taking it easy. I’m pissed to have endured all that rain and no golf, only to mess myself up as soon as it got nice outside. At every juncture on this little journey, I would explain I tripped over a parking lot car stopper. 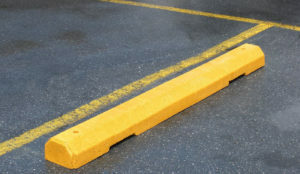 And almost every single person had a story about a pedestrian accident involving parking lot care stoppers. I had never given them much thought, but you can bet I will now. Please be careful out there. We don’t bounce like we used to.